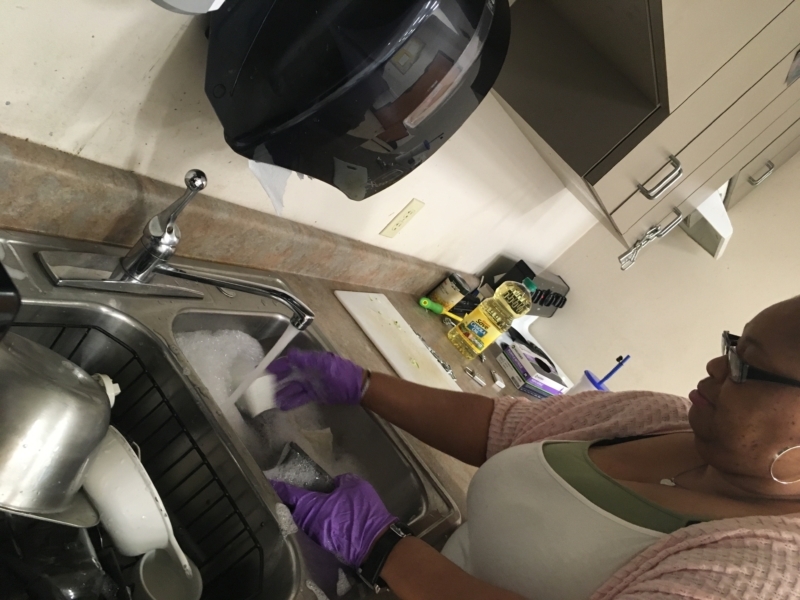 It was a steamy morning with thunderstorms looming, but the kitchen in the activity room at Swope Health Services was full of warmth and anticipation. 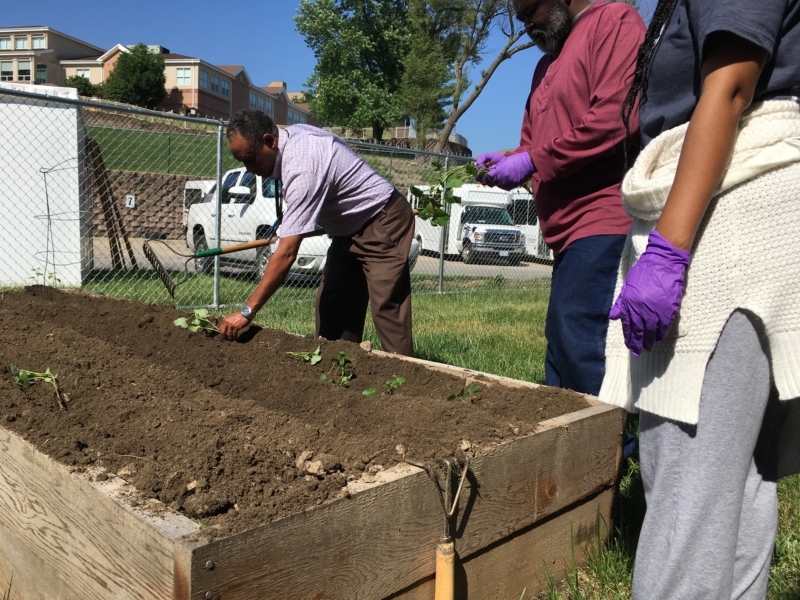 Today, instead of working in the SHS garden, a group of participants in the adult Community Psychiatric Rehabilitation Program (CPRP) were following the directions of Lenise James, Community Support Specialist. 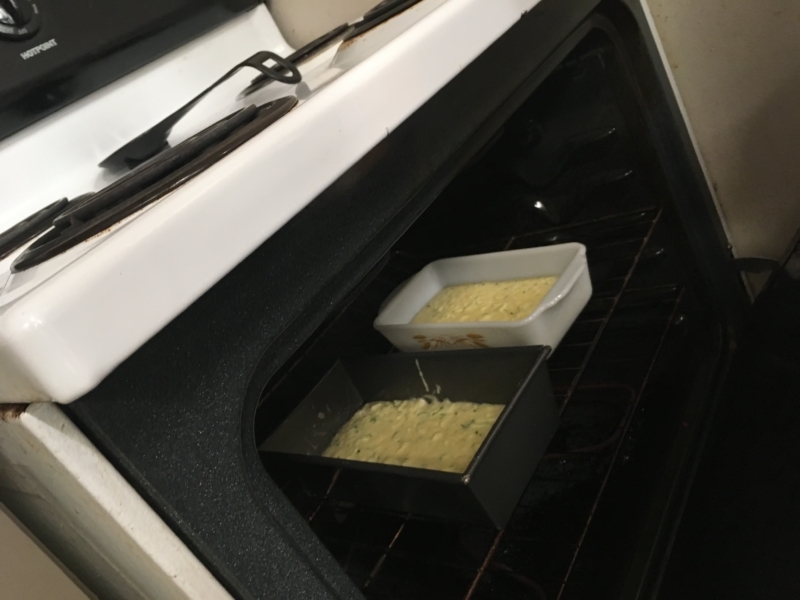 On this day, the participants in the Power, Hope and Recovery Program (PHRP) would put their skills to use in trying out a recipe for Zucchini Lemon Bread. 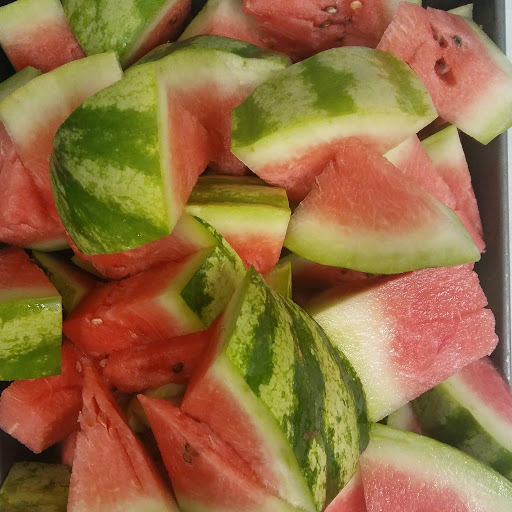 The ingredients were laid out on the table, along with bowls and utensils like a lemon zester, a juicer, measuring spoons and cups, whisks, spoons and spatulas. There was a flurry of activity as each of the five participants tried out a new tool for the first time – a Salad Shooter. Lenise demonstrated its use first, explaining how it works and how the resulting shredded zucchini will provide moisture in the cake. Each one took a turn using the shooter, feeding a chunk of zucchini and watching it transform into shreds. Each one showed the next how to use it, adding tips to help. 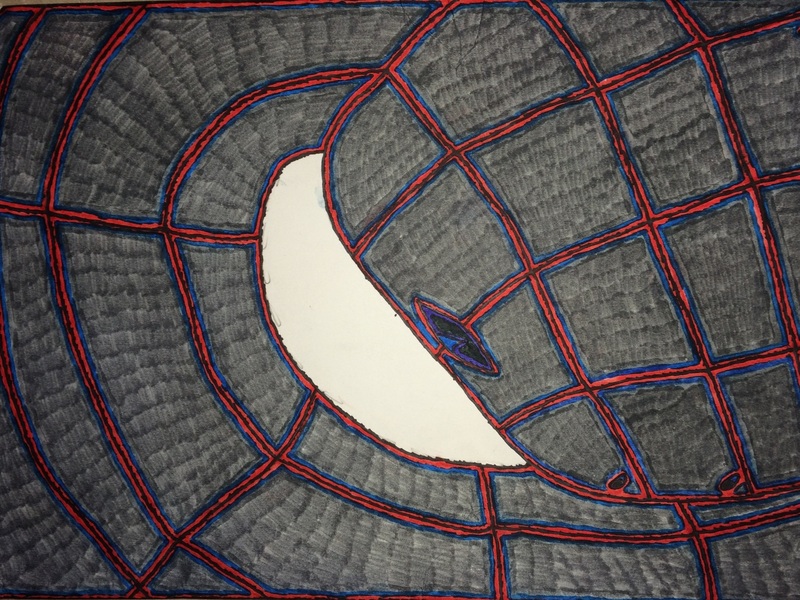 It was a simple thing, each helping the other, all learning together. 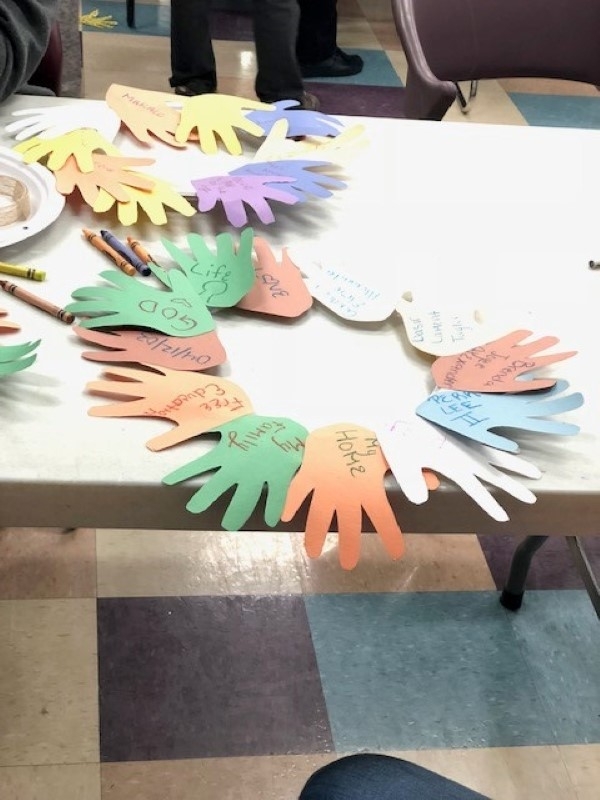 The lessons were practical and immediately put to use, but they also resonate as lessons everyone can use throughout the day – be kind, help each other. 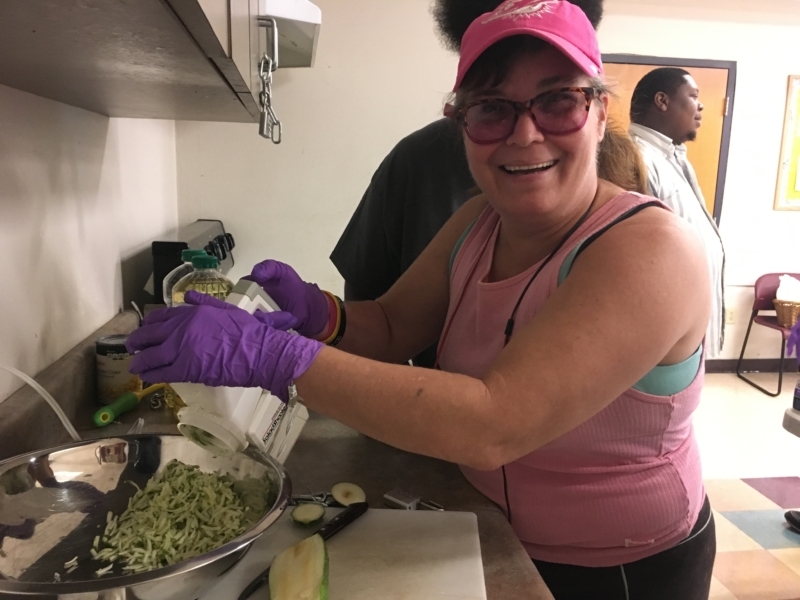 “I love cooking, I absolutely love this,” said Brenda, one of the participants. “It’s so much fun.” Antwan suggested they make pesto next week, to use up the last of the basil planted out in their gardens. 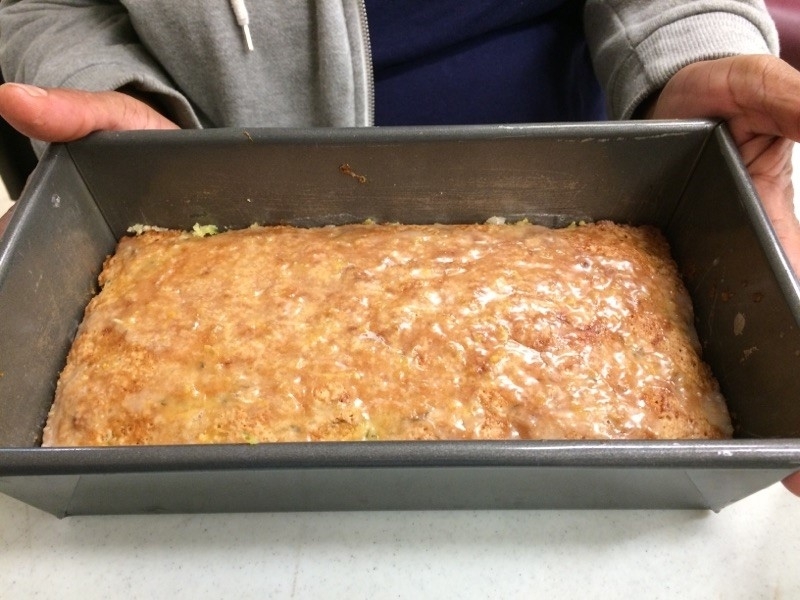 Others recalled a delicious cornbread from a previous cooking day. 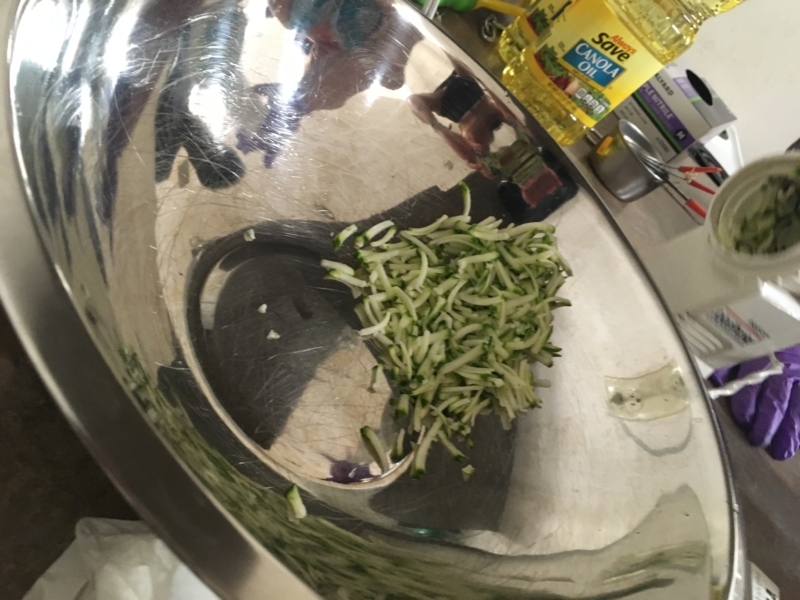 The Salad Shooter produces shredded zucchini. 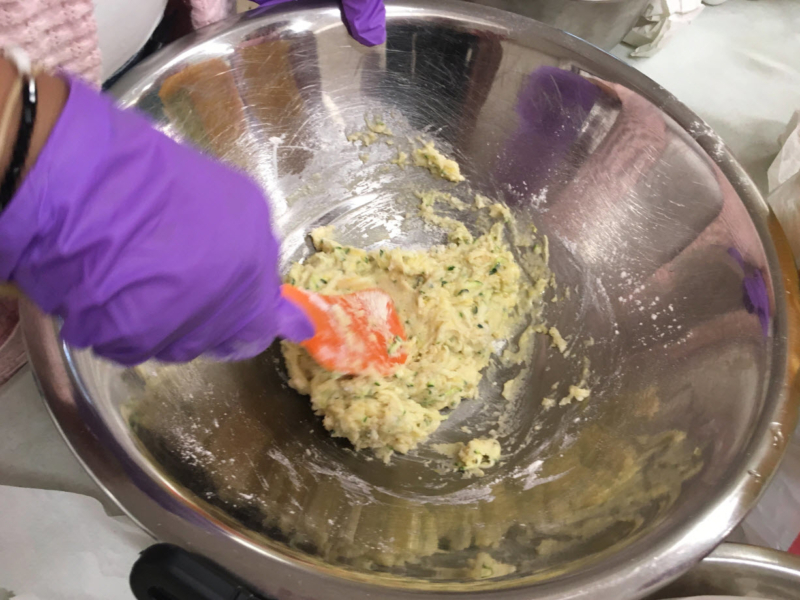 Step by step, Lenise and the team put together the ingredients, first the wet ingredients, then the dry, then the two mixed together. Brenda adeptly juiced the lemons, while Rosie took control of the zesting duties. “This is really good for taking out your frustrations,” Rosie said at one point, surveying the mound of lemon zest that had accumulated after she muscled through the lemon skin all the way to the fruit. 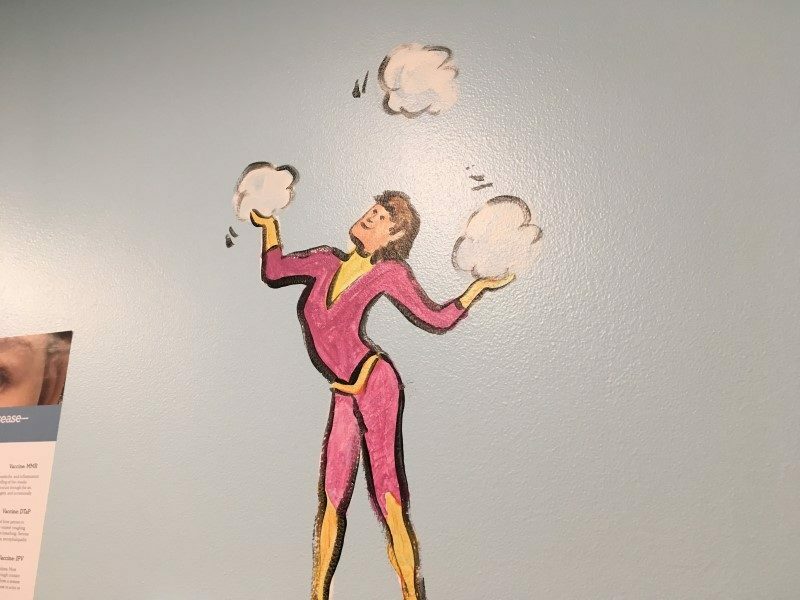 When she was advised to use a lighter touch, she replied, “I can’t help it if I’m strong.” But she tried again, and this time did it more slowly and gently. The results were perfect. 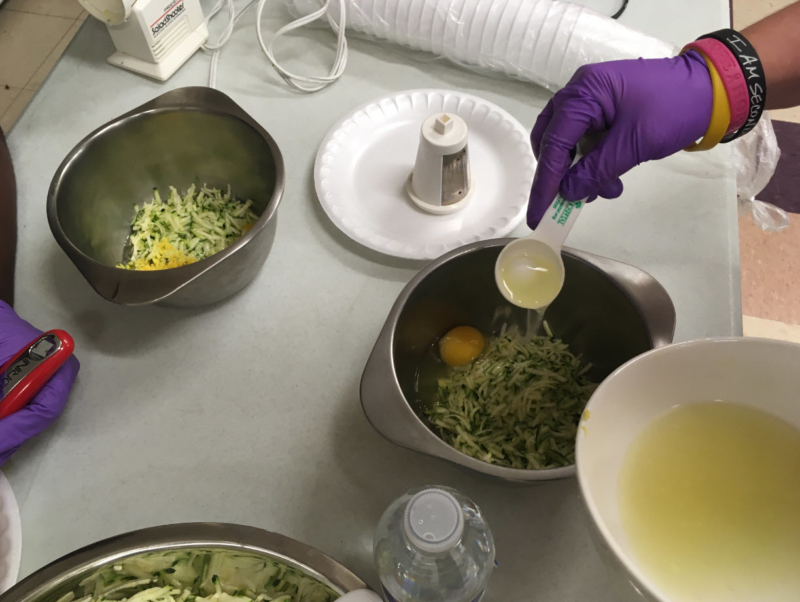 As the aroma of the lemon zest wafted through the kitchen, Lenise demonstrated how to properly measure the dry ingredients using measuring cups and spoons. 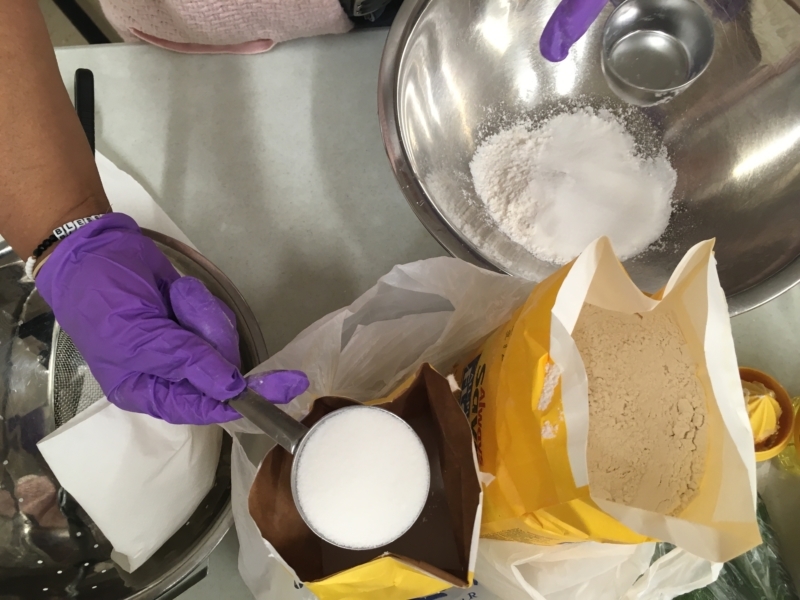 Deborah carefully measured her dry ingredients — flour, sugar, salt, baking powder and baking soda – checking to make sure she added the right amount each time. Orlando did the same with his batch. Brenda has some fun working the Salad Shooter. 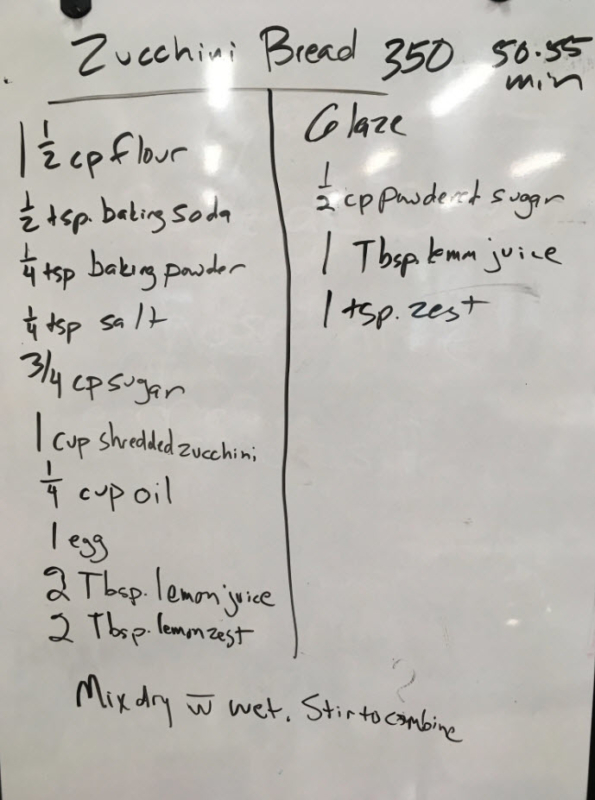 The program teaches practical skills, like measuring and following instructions in a recipe, but it also emphasizes life skills – listening, sharing, patience, kindness. Working together, there is an accomplishment at the end of the session: a jar of pickles, a loaf of bread, a meal. 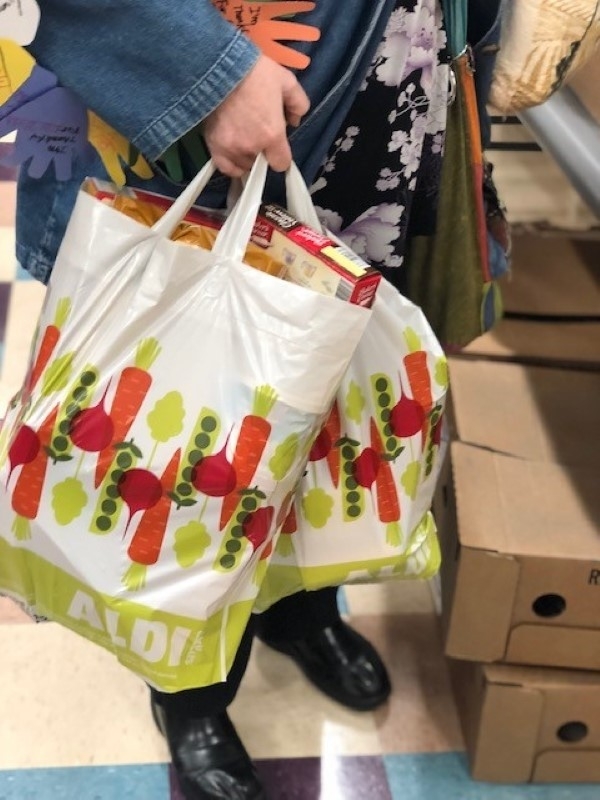 Once again this year, the adult CPRP program is offering participants “Eat Well on $4/Day, Good and Cheap,” by Leanne Brown, an acclaimed book that focuses on removing barriers from good nutrition. The book offers recipes and techniques to help make tasty food on a strict budget, aligned with the federal Supplemental Nutrition Assistance Program (SNAP). 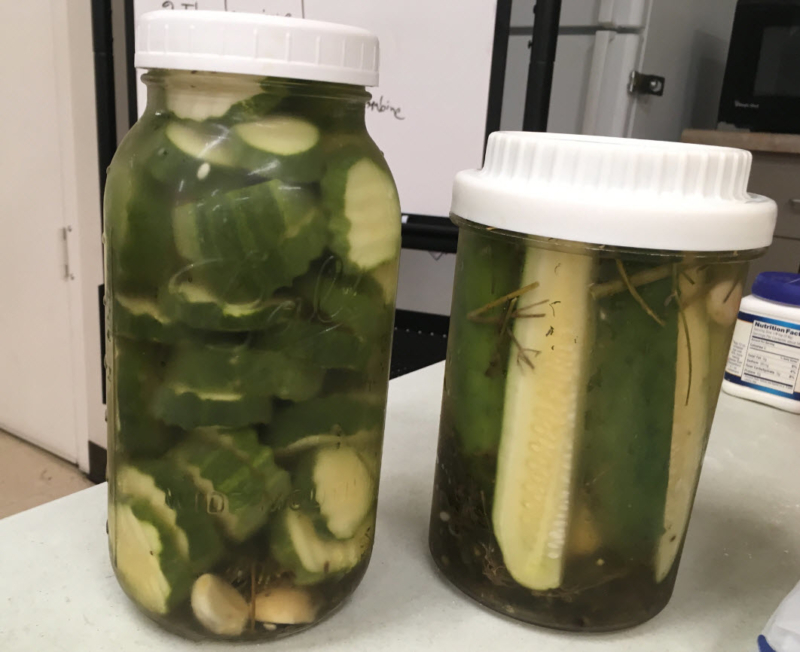 The adult CPRP program, directed by Sonia Bolden-Oakley, supervisor, also runs the SHS gardening program, which produces cucumbers, pepper, potatoes, zucchini, herbs and more. 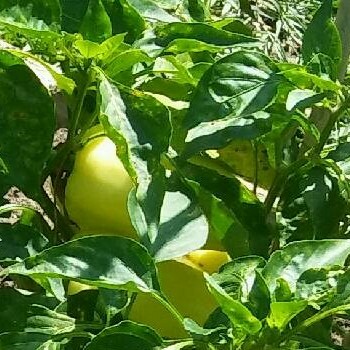 This year, the garden added a peach tree, which Richard, a long-time participant, named Tummy. Why? “Because those peaches will be in everyone’s tummy,” he joked. 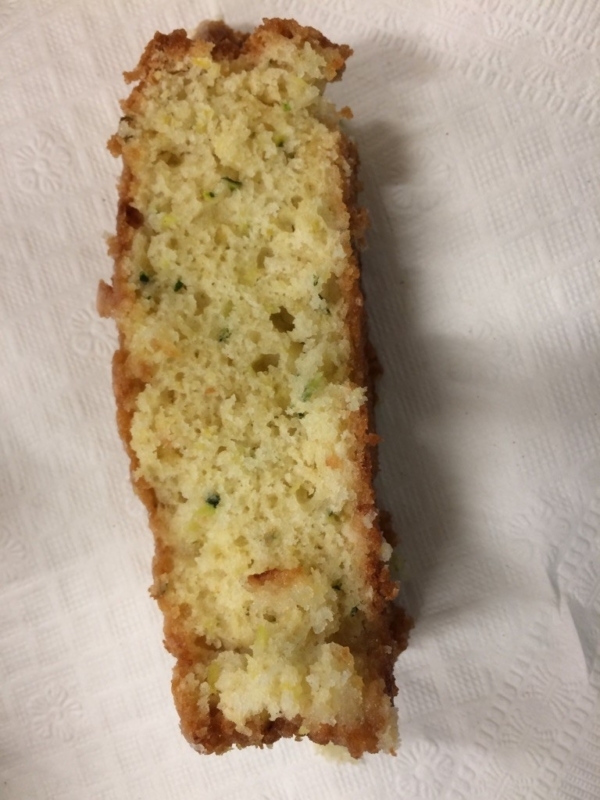 And as for the Lemon Zucchini Bread? Assembly of the wet ingredients. Measuring out the dry ingredients. Putting together the wet and dry ingredients to make a stiff batter. The finished batter, in loaf pans, ready for baking in the oven. Clean-up is part of every exercise. Here, Deborah takes on the dishwashing. Pickles, from an earlier cooking class. The Zucchini bread, fresh from the oven. A close-up of the moist, lemony zucchini bread. 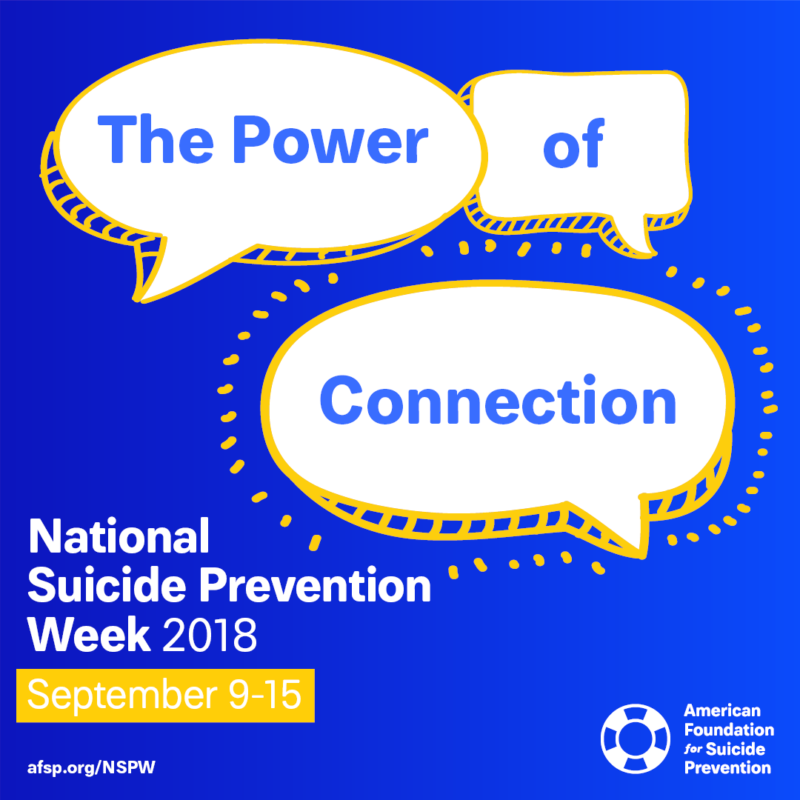 Swope Health Services is joining in the campaign to raise awareness of suicide prevention, in alignment with National Suicide Prevention Week, Sept. 9-15, 2018. Encouraging kindness: SHS is using “Care Cards” to provide an extra outreach and show support to anyone facing challenges. The postcards have simple messages, like “I Care About YOU.” SHS providers, case managers and associates are invited to use the cards with their patients and clients. 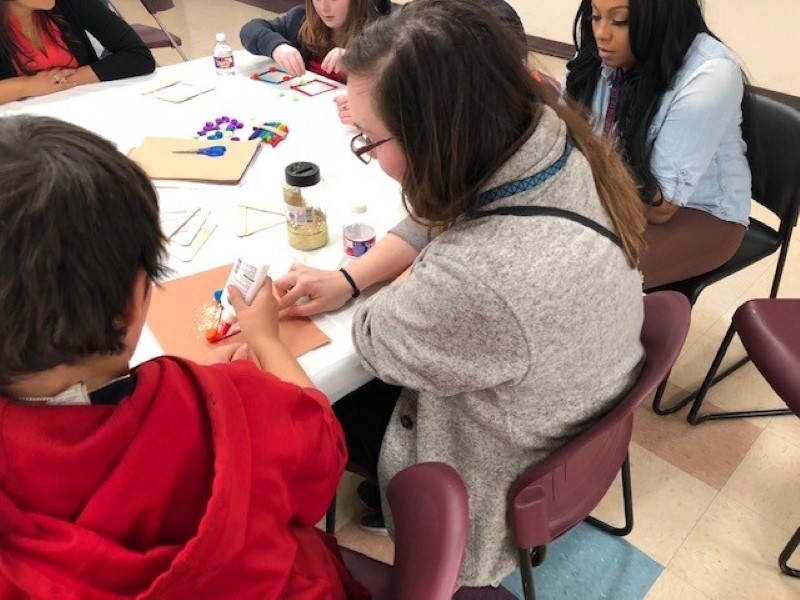 Cards are developed by participants in the Community Psychiatric Rehabilitation Program and will be available through the crisis staff for anyone to use. Advocating for primary care providers’ engagement in identifying behavioral health issues. 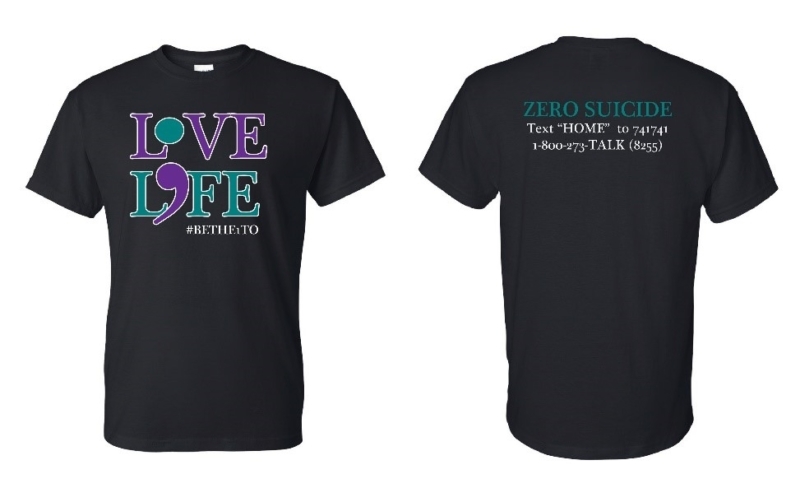 As part of the Zero Suicide initiative at SHS, providers and clinical staff are encouraged to use a standard Patient Health Questionnaire (PHQ) to identify patients in need of support. A majority of suicides – 83 percent – are completed by people who had seen a primary care provider within a year, Nicole said, citing data from Zero Suicide. 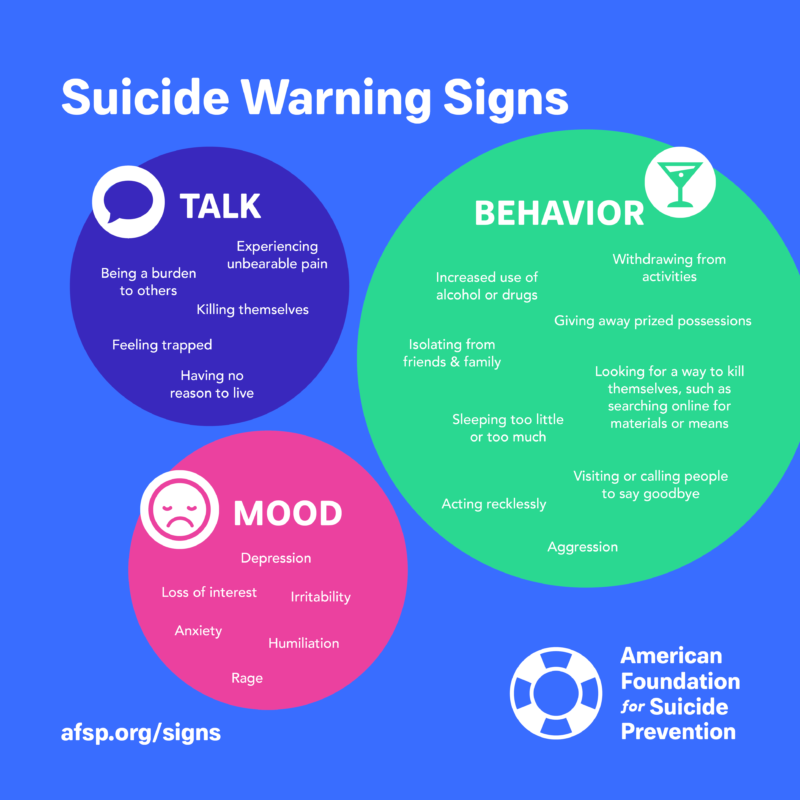 The idea is that providers can help reduce suicides by recognizing depression and other warning signs and addressing those issues. There is no single cause of suicide – it occurs when an individual becomes overwhelmed by stress and experiences feelings of hopelessness and despair. 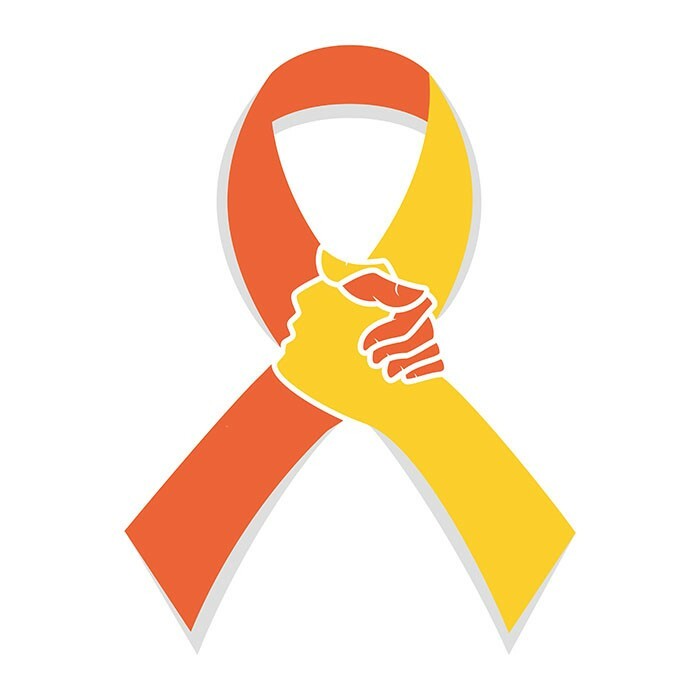 Each year, nearly 45,000 people complete suicide, making it the 10th leading cause of death in the U.S., according to the American Foundation for Suicide Prevention. Depression is the most common condition associated with suicide, and it is often undiagnosed. That’s why it is so important to be aware of depression and other mental health conditions, and to address them with treatment. Events like these at Swope Health aim to remove the stigma associated with suicide and depression, Nicole said. Call the Access Crisis Intervention Mental Health Crisis Hotline: 1-888-279-8188. These confidential calls are routed to Swope Health and provide direct local support. Send a text to 741 741. You can text the word “home” or ask a question. 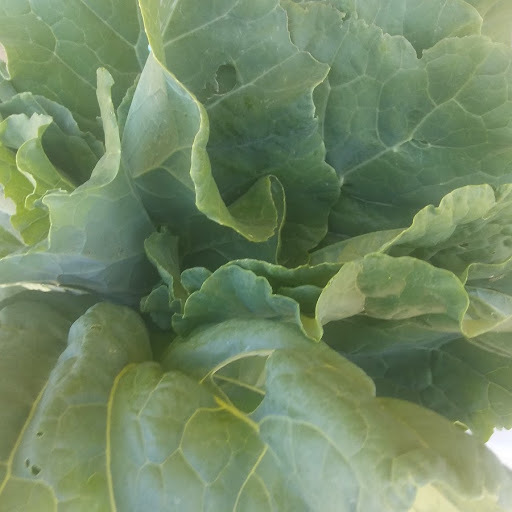 Collard greens and kale ready for picking, with Garry hard at work in the SHS garden in the background. The sun was beaming on the Swope Health Services gardens at mid-morning as the gardeners began assembling to plan out the day’s work. The gardeners are all members of the adult Community Psychiatric Rehabilitation Program (CPRP), along with Lenise James, Community Support Specialist. Today’s tasks involved examining the crops already planted and then preparing two beds: one for sweet potatoes and one for zucchini. 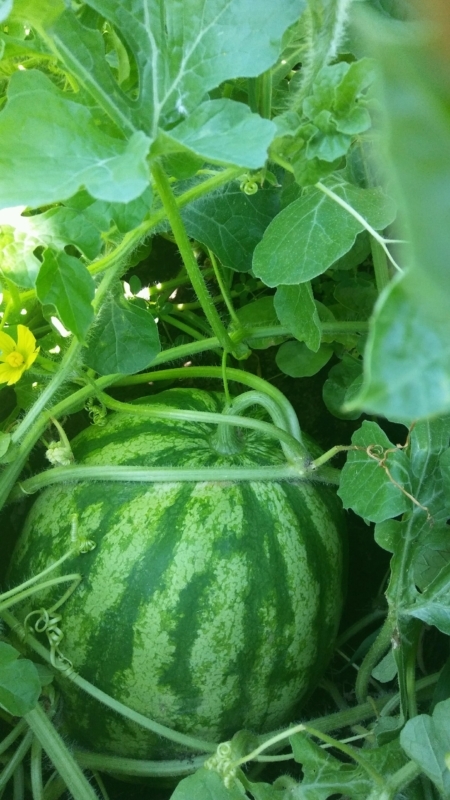 Gardening empowers the participants, giving them specific tasks and focus. Participants follow their interests: Garry takes a shovel and makes short work of preparing the bed for planting; Antwan, who aspires to be a herpetologist, inspects the garden for bugs – he finds earthworms, grubs and a caterpillar and he’s happy there are no signs of Japanese beetles. Stephan relishes the task of harvesting collard greens. About 15 individuals in the CPRP participate in the gardening activity two or three days a week, weather permitting. 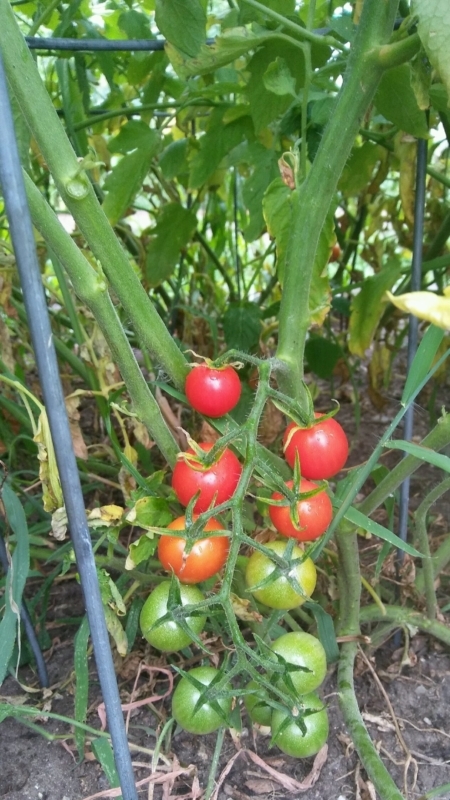 They plan for three seasons, rotating crops in the eight beds, and then they take care of watering, weeding and generally nurturing the plants to harvest. Abera Kelecho shows Lorena and Stephan how to plant sweet potatoes. “We have a good time,” Lenise says, with her gardeners nodding in agreement. The gardens are a tangible expression of caring and nurturing, raising up tiny seedlings, and ultimately, cooking and eating the bounty that comes from the plants. 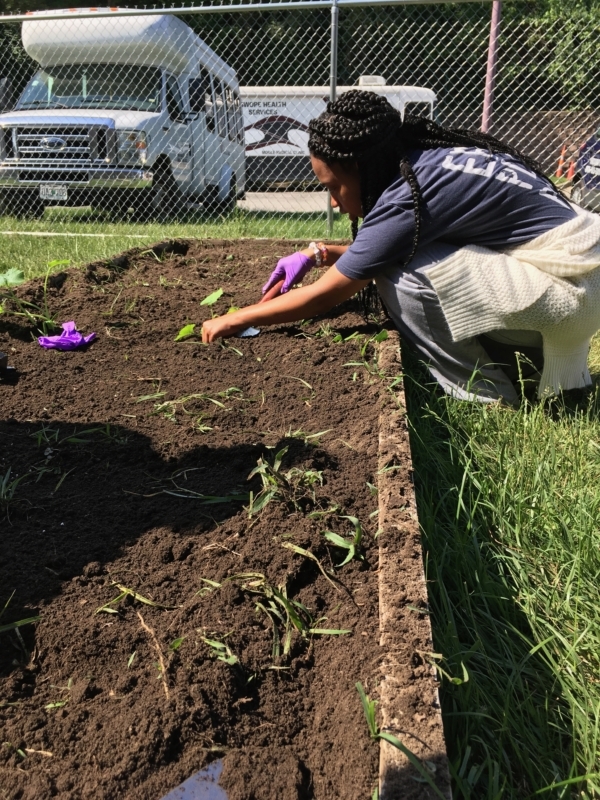 This year’s garden program included a class on tomatoes, presented by the Kansas City Community Garden, and hands-on experience in planting and tending vegetables and herbs. Lenise notes it also gives some of the members a chance to teach the others. Some have experience and enjoy sharing memories and insights with others. Abera Kelecho, case manager, joins the group this morning to help with planting sweet potatoes. There’s plenty of lively chatter as he demonstrates how to separate the tender plants and prepare them for planting. Lorena carefully positions the seedling zucchini in the garden. Novice gardener Lorena listens intently and follows the guidance, earning praise from Abera. The garden gives the group a chance to plan for the future as well as remember the past. Every year, the team dedicates a memorial to honor fellow gardeners who recently passed away. This year’s memorial will be a large planter, filled with healthy and thriving herbs. The herbs will join the other plants when harvested in creating meals like collards and cornbread. “They are so delicious,” Clarence said. Soon the team was busy recalling past meals from the garden while making suggestions for the next one. Six members of the CPRP team, led by Sonya Bolden-Oakley, Supervisor, support the partnership that produces and manages the garden. Co-leads are Lenise and Mark McIlroy, an experienced gardener and community support specialist. 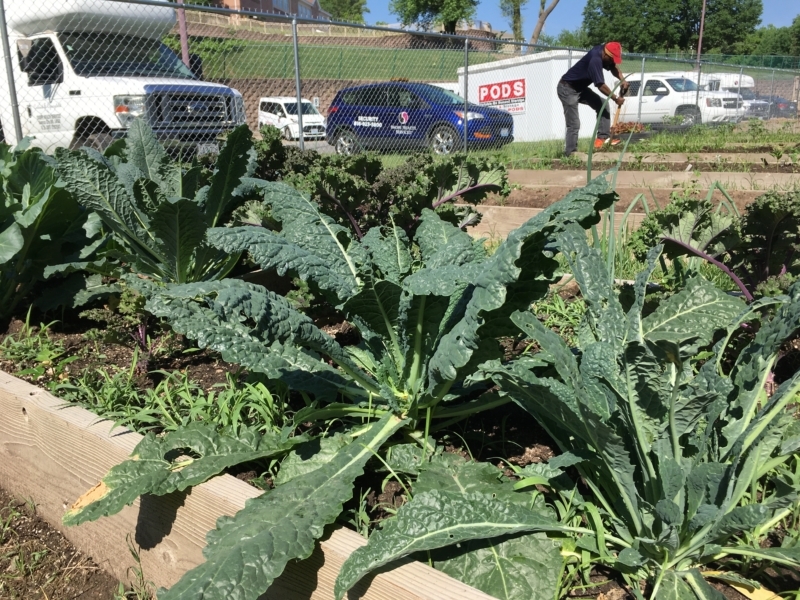 The program is also supported with a grant from Kansas City Community Gardens. 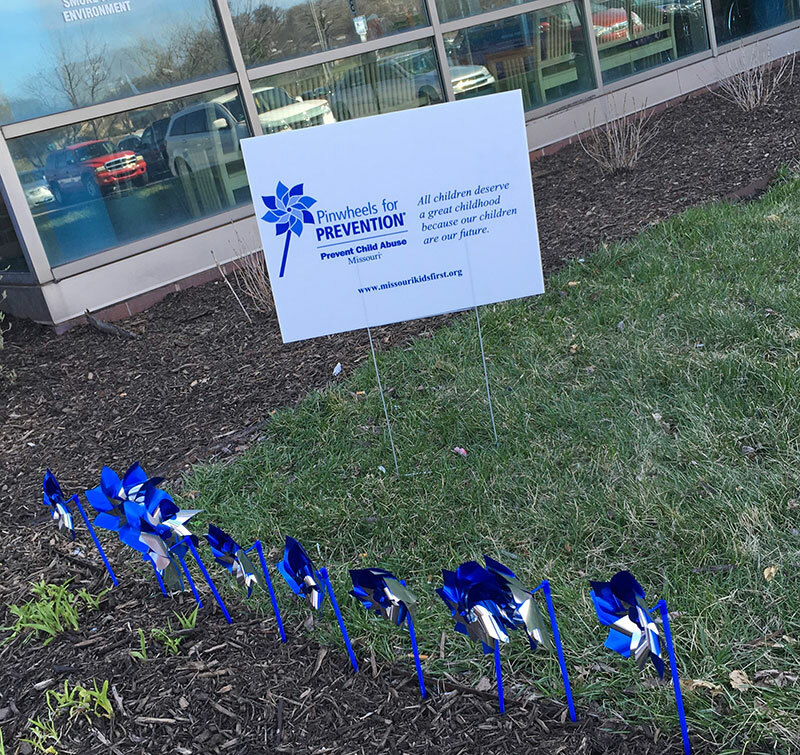 Quietly, after more than a year’s worth of planning, Swope Health Services launched a transformational program to improve access to mental health services. SHS Behavioral Health is now a designated Certified Community Behavioral Health Clinic. SHS is one of 15 agencies in Missouri named to participate in a two-year demonstration project, directed by the federal government. There are a total of eight states participating. The point of the demonstration project? To make it easier for the community to access a broad spectrum of behavioral health services. 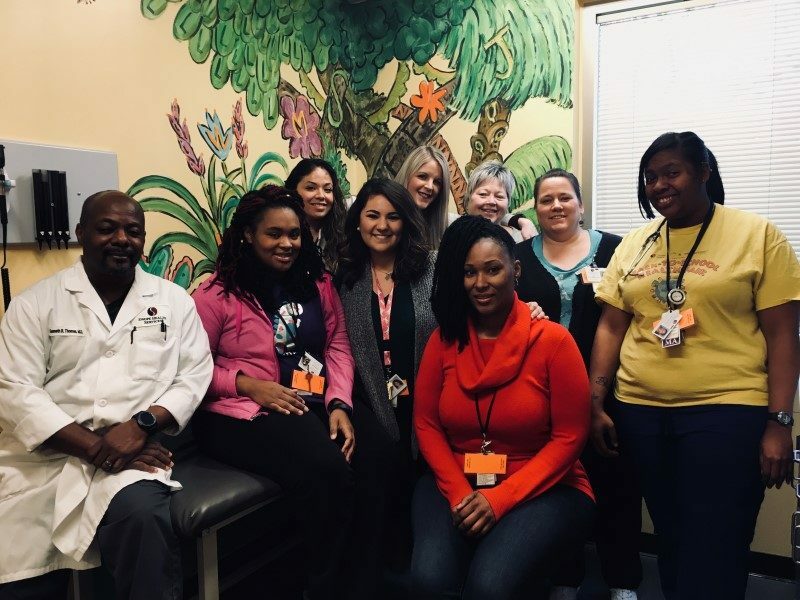 As part of the new designation as a Certified Community Behavioral Health Clinic, SHS opened a new Behavioral Health Children’s Services Clinic. The center offers new services for children in a newly renovated space. 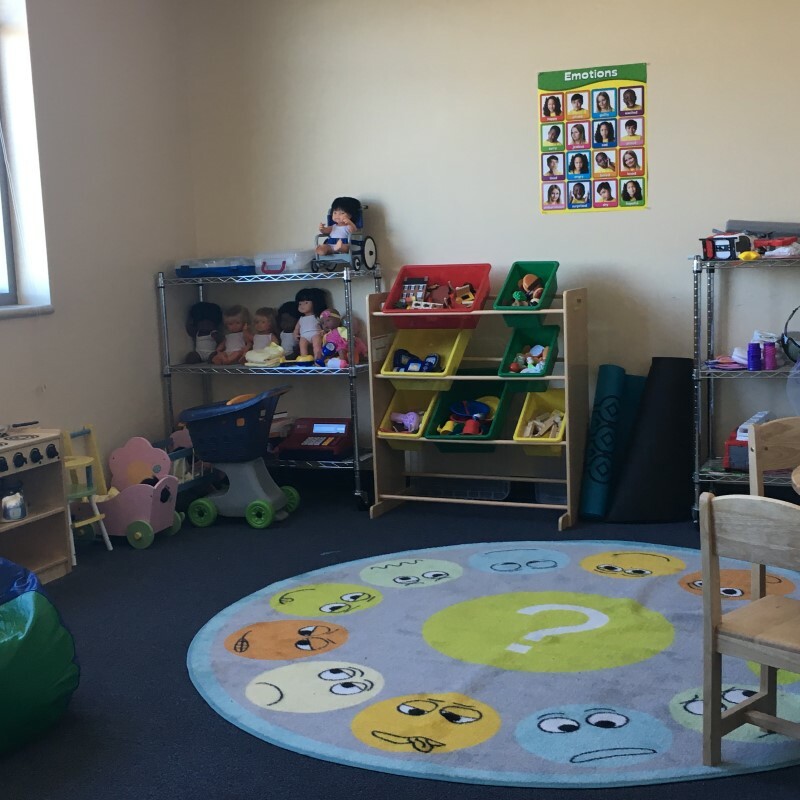 The Behavioral Health Children’s Services Clinic at SHS Central, a new space that integrates children’s psychiatric services, therapies and programs, with added security in separation from adult programs. The new space features a bright lobby and reception area, a community conference room, children’s play area plus access to all the children’s services. This new space opened Jan. 16, 2018. 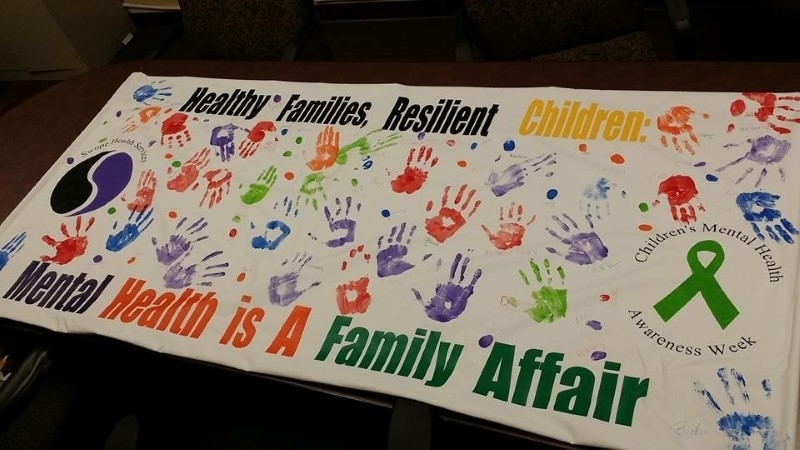 A new service focused on Children’s Substance Abuse. The new Opioid Clinic, launched in Fall 2017. A new program focused on Hospital Discharge Coordination. In this program, SHS undertakes outreach to hospitals to coordinate transition of care for SHS patients. 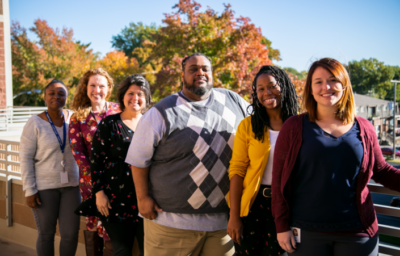 Enhanced staffing, with the addition of three new Children’s Therapists, five new Care Coordinators and other positions behind the scenes. Some of the biggest changes actually are occurring behind the scenes, Miller noted. 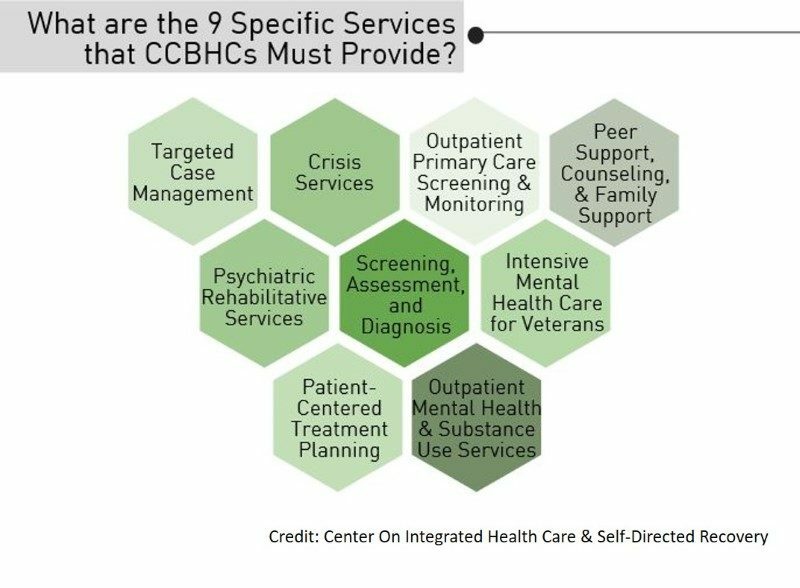 For example, one part of the new CCBHC program revises the entire financial model, moving from charging a fee for every service to a single rate that covers all the services a patient chooses. There is an emphasis on value, making sure clients are receiving as much support as they need. SHS has been operating under this new model for about six months, and is reviewing data from the program to assess performance. The Behavioral Health team is using the data to guide changes and where needed, make additions to the programs. “With the new qualitative data, we’ve had some ‘a-ha’ moments,” Miller said. 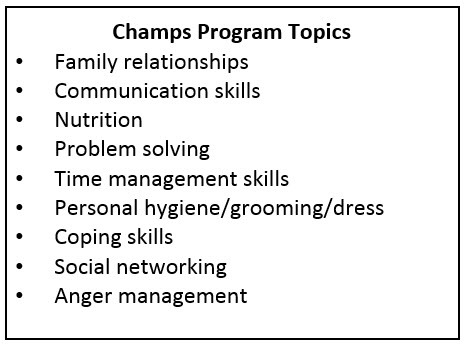 For example, based on data, the team has reorganized some functions and realigned some services for maximum impact. 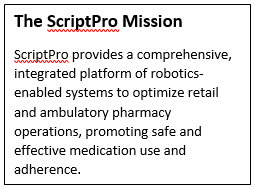 Since this is a pilot program, SHS is in a position of leadership to influence the ultimate design of the program. It’s expected that this program will be rolled out across the state. 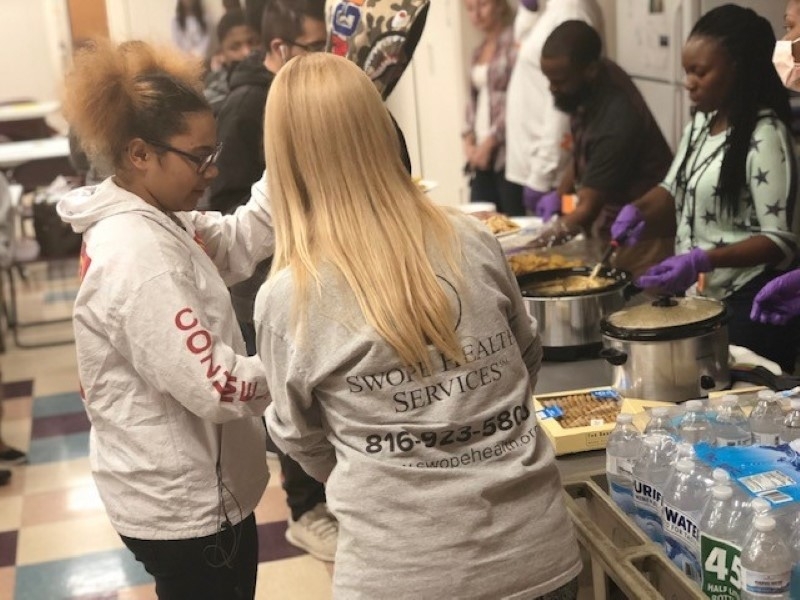 This experience gives SHS the opportunity to influence related and complementary programs, such as those run by Jackson County or Kansas City, while also expanding access to quality Behavioral Health programs. At long last, the dust is settling at Swope Health Services as three major renovation projects are coming to completion. The north side of the second floor of building B at Central Facility is now home to an integrated Children’s Services Center. 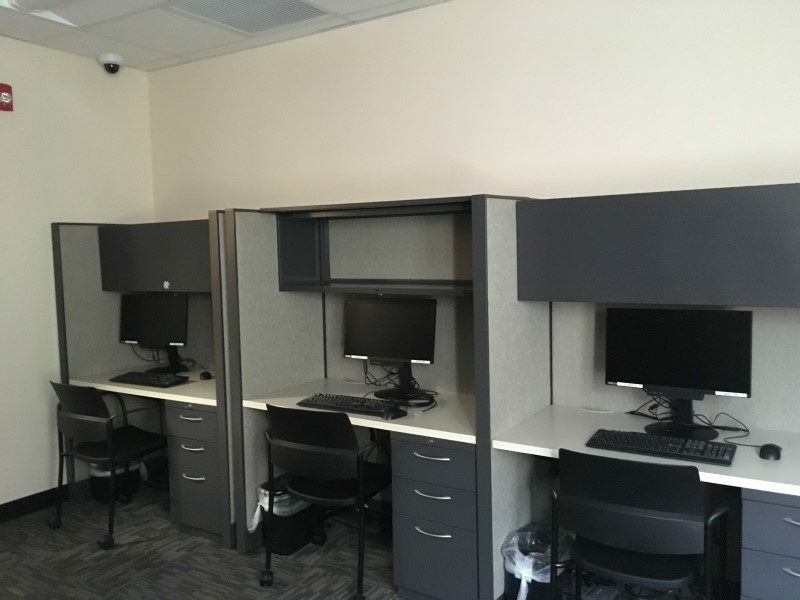 The new center is securely separated from adult services, and includes room for new services. The total renovation of the 5,200-square-foot area cost $300,000, and took about four months of intense construction. 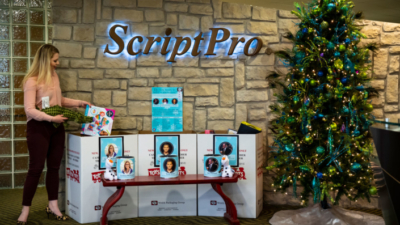 The project included creation of a new lobby and reception area, a community conference room, a “grand room” for groups of 30, a children’s playroom, two new treatment rooms, three new provider offices and a much-needed storage room. Additional renovation upgraded the staff breakroom, cubicles and hallways. The result is bright and lively, full of vibrant colors. The new playroom in the Childrens’ Services Center is packed with games and toys in a fun space. The project was designed by Bell/Knott & Associates Architects of Leawood, Kansas, and construction was performed by Purdum Construction of Overland Park, Kansas. Mark your calendars for the Grand Opening: 8 a.m. Friday, March 30. Debbie Meads, Program Manager, shuffled departments and clinics for about a year to make room for a vastly expanded Pediatrics and OB-GYN service area. In Pediatrics, there are now 15 treatment rooms, up from 10. The Obstetrics clinic grew from nine rooms to 23, with space to support seven providers. 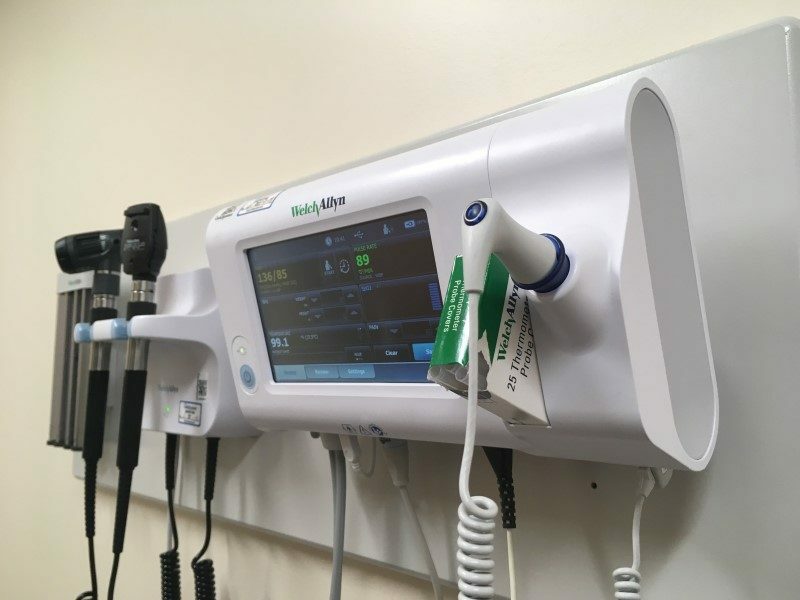 Some of the additions in OB-GYN – like wall-mounted vital signs monitors – speed up examinations, as medical assistants no longer have to wheel in mobile units. Plus, the readings from the monitors now flow directly into the patient’s electronic medical records, reducing potential for errors in transcribing the data. The Pediatrics team in one of the new exam rooms. “It’s faster for the staff and that means faster care for the patients, too,” Debbie said. But, he added, “The beauty is just a bonus – the most important thing is how we’ve expanded. The final phases of construction are wrapping up this month. This project was supported by the Health Resources and Services Administration (HRSA) of the U.S. Department of Health and Human Services (HHS) under grant number C8DCS29675 Renovation of SHS-Central Pediatrics & OB/GYN Clinics with an award of $1 million with $800,000 financed with nongovernmental sources. The project encompassed 12,955 square feet, or about 10 percent of the entire Central facility. The design work was completed by Garcia Architecture LLC of Kansas City, and Purdum Construction handled construction. The Pediatrics and OB-GYN Grand Opening will be at 8 a.m. Friday, May 11. The new computer lab at Imani House. SHS’s Imani House is a freestanding facility for substance abuse treatment, just behind SHS Central, at 3950 E. 51st St. The 10,733-square-foot facility was updated from top to bottom in this project, which began in 2016 and cost more than $655,000. 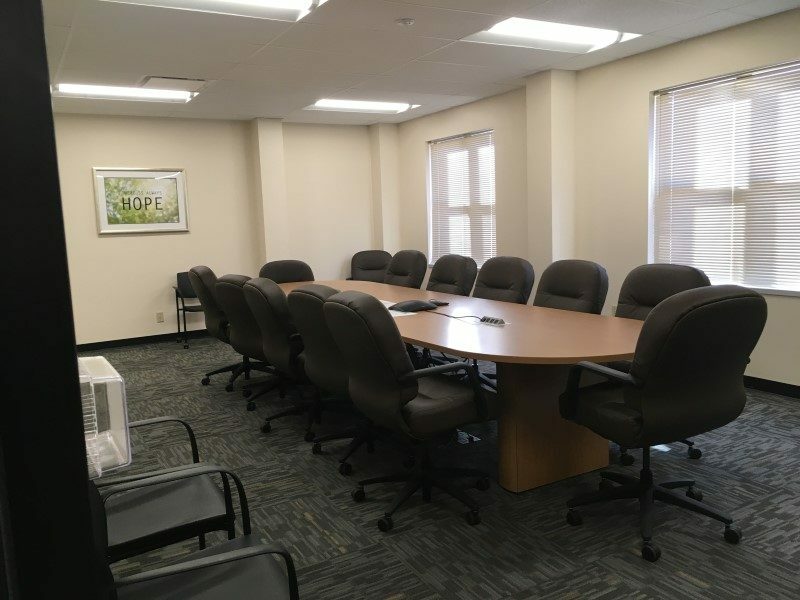 There are two new group rooms, a conference room and a new six-station computer lab. There’s also a workout space, plus all new offices and remodeled group meeting spaces throughout. 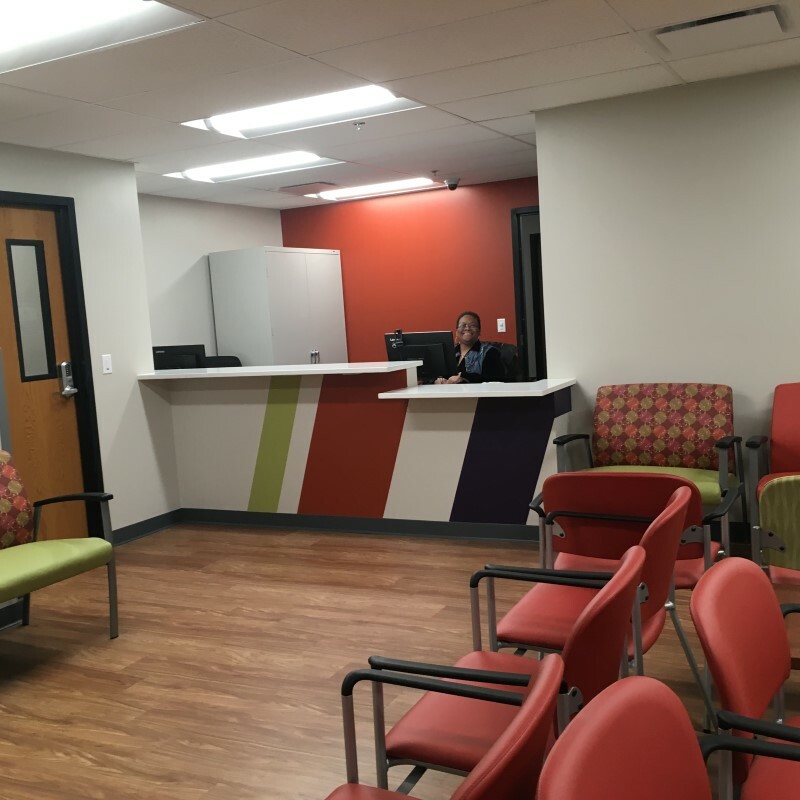 “These renovations, along with new programming, have shifted the atmosphere into one clients and associates alike can be proud of,” said Andrea Buford, Director of Clinical Operations, Behavioral Health. The project was designed by Bell/Knott & Associates Architects with construction performed by Purdum Construction. The finishing touches will await warmer weather – that’s when the new landscaping will be added, just in time for the grand opening. 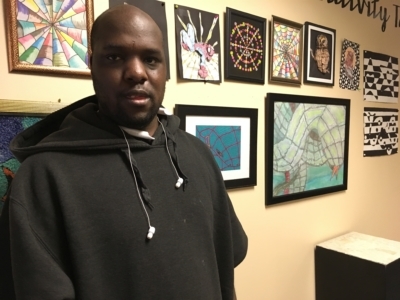 The Imani House Grand Opening will be 8 a.m. Friday, April 20. Please add these dates to your calendars and plan to join us to see the changes for yourself. 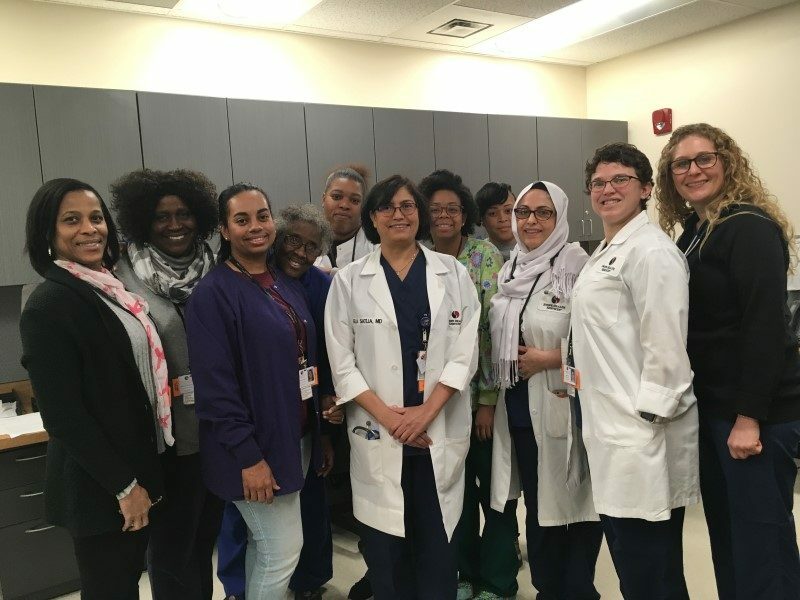 The OB-GYN team in their new workroom. One of the new conference rooms at Imani House. There’s bright and whimsical artwork throughout the new Pediatrics clinic. An example of the built-in vital signs monitors in the new Ob/Gyn clinic exam rooms.